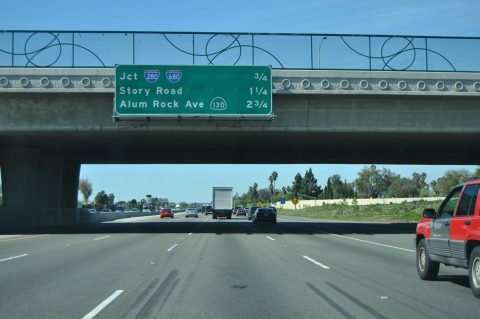 Often referred to as one of the most scenic urban freeways in America, Interstate 280 (Junipero Serra Freeway and Sinclair Freeway) comprises both an alternate and commuter route from San Francisco to San Jose. 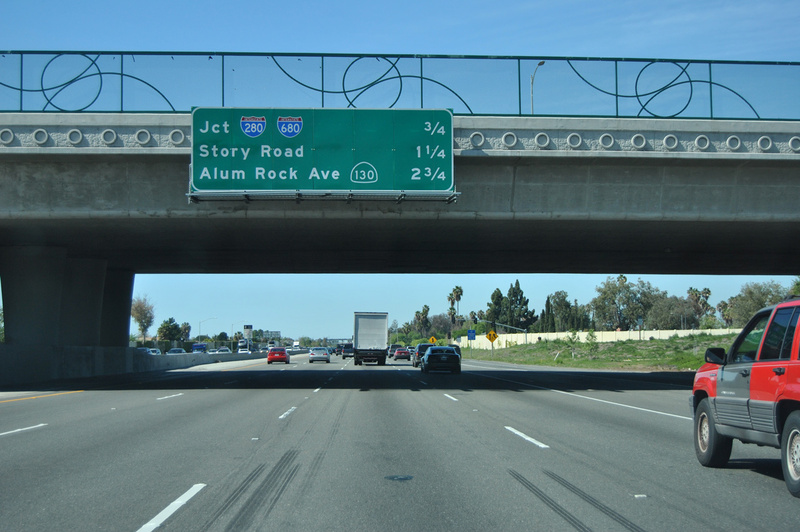 Bypassing the more industrial and crowded U.S. 101 (Bayshore Freeway), I-280 is eight lanes throughout. It follows the San Andreas fault line along the San Francisco peninsula. 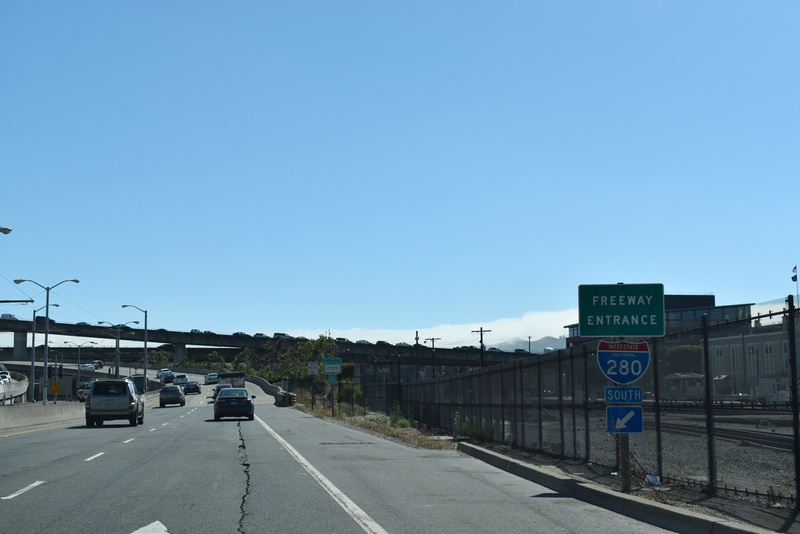 Interstate 280 at the directional T interchange with I-380 in San Bruno. Photo taken 07/11/18. Originally planned to connect with Interstate 80 near the San Francisco-Oakland Bay Bridge, I-280 ends just shy of the parent route. It used to extend as far as Third Street, but now concludes two blocks southwest of Oracle Park (home of the MLB San Francisco Giants), where it transitions onto King Street and ultimately the Embarcadero. Caltrans Postmiles extend along the I-280 ramps to Brannan Street instead of King Street. 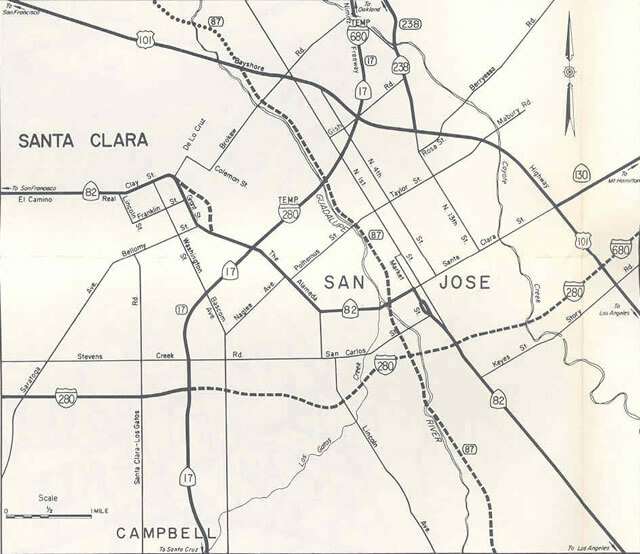 The 1968 California Official Map indicated that Temporary alignments for I-280 and I-680 followed California 17 (I-880 today) through San Jose before the two freeways were completed. 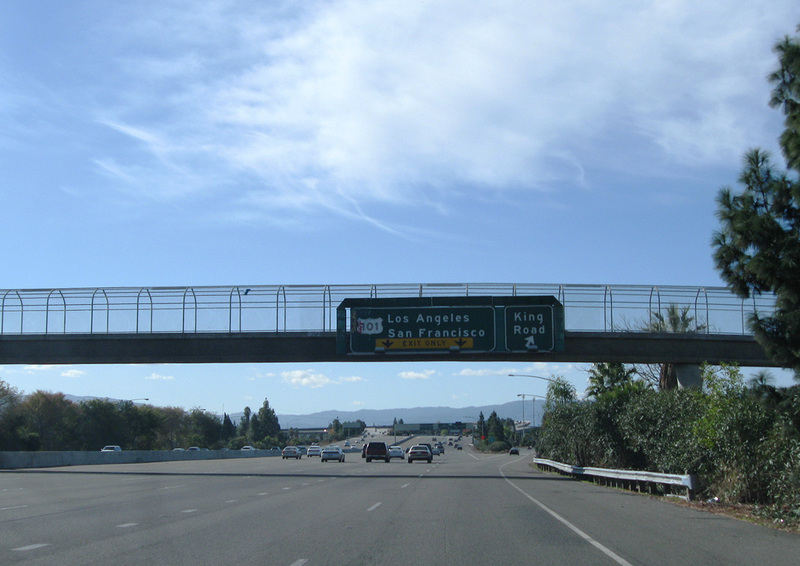 The east-west portion of Interstate 280 between California 17 and U.S. 101 opened to traffic in mid 1972. 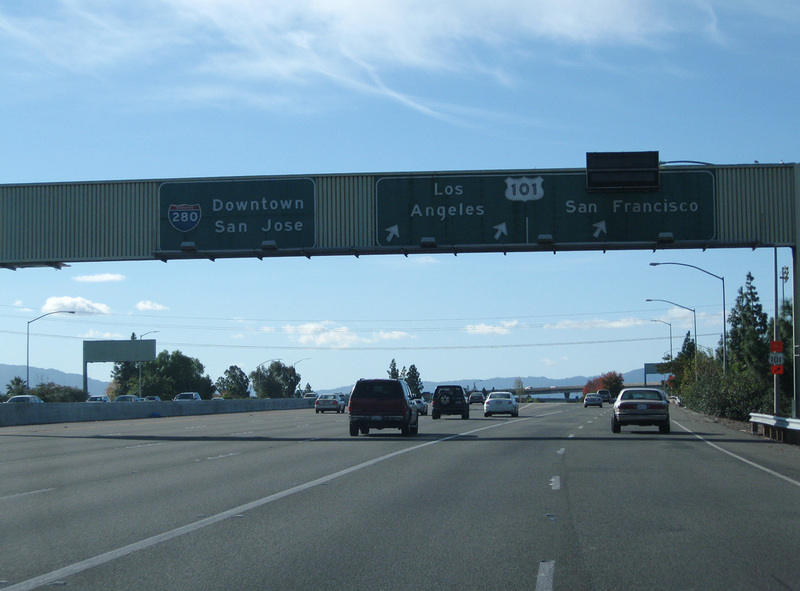 The south end of Interstate 280 defaulted traffic to U.S. 101 (Bayshore Freeway) until September 4, 1974, when I-680 was completed through San Jose. 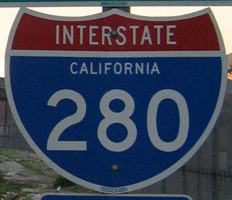 Interstate 280 designated as California 82 (Southern Freeway) in 1965. Interstate 280 was added along side California 82 in San Francisco in 1965 and dropped along the freeway in 1968. One of several routes cancelled during the San Francisco Freeway Revolt of the 1960s, Interstate 280 was originally proposed along a different course than where it ends today. 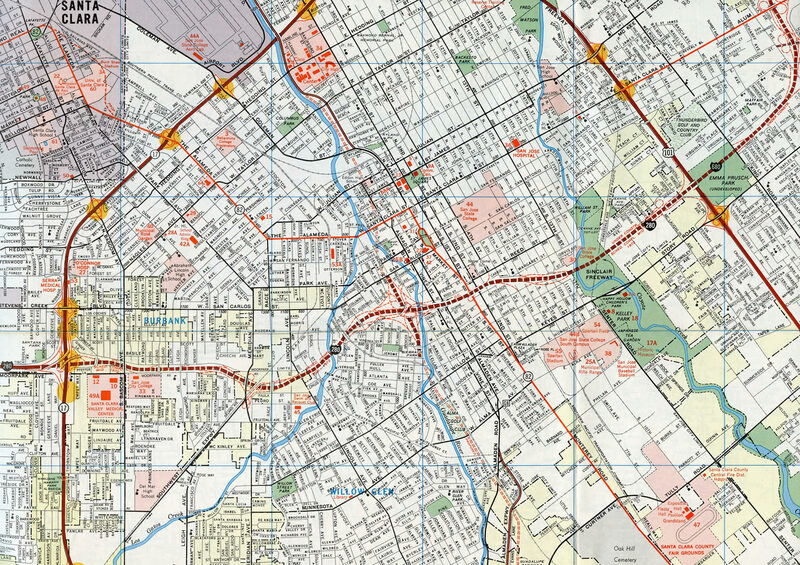 As displayed on the 1964 Official California State Map, the section of today’s I-280 between SR 82 and I-80 was to be signed as a northern extension of SR 82 and SR 87. 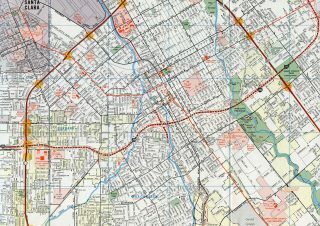 I-280 was instead proposed to run northward along a corridor roughly paralleling SR 1 (19th Avenue). 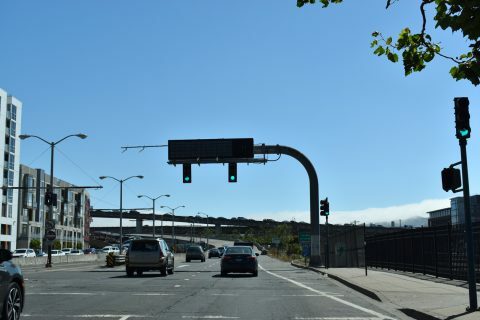 It was to follow Junipero Serra Boulevard, Portola Drive and Seventh Avenue, then skirt the eastern edge of Golden Gate Park, where it would have converged with a western extension of I-80. Continuing north, I-280 would have followed Park Presidio Boulevard into the Presidio. Interstate 280 would have ended at the southern end of the Golden Gate Bridge, where U.S. 101 would continue north to Marin County and Interstate 480 would turn east along the unconstructed Golden Gate Freeway and demolished Embarcadero Freeway to connect with I-80 at the San Francisco-Oakland Bay Bridge. 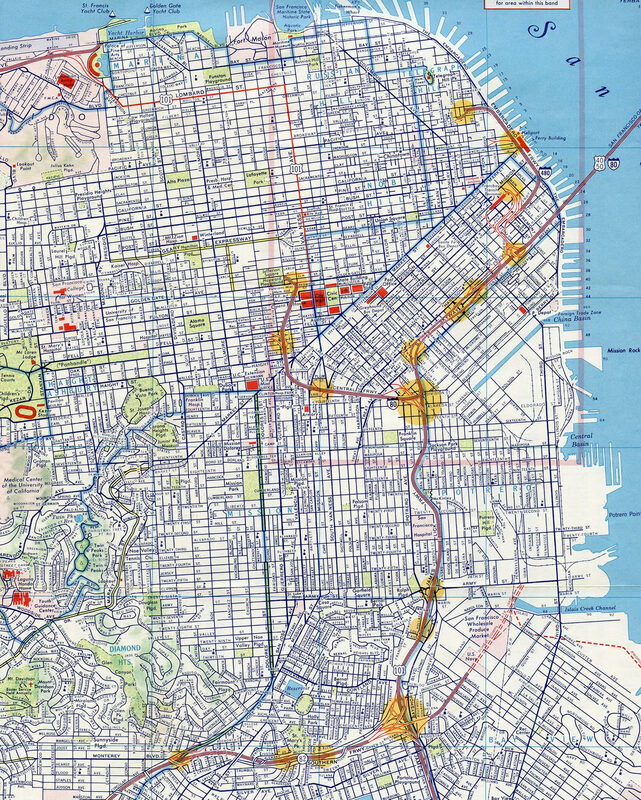 This in effect would have created a belt freeway system for San Francisco. 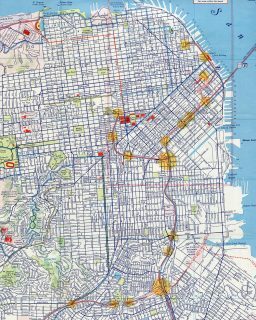 However, between 1965 and 1968, San Francisco city government decided not to construct most of the planned freeway system. Short portions of SR 480 (Embarcadero Freeway) and U.S. 101 (Central Freeway) were built, but neither spur connected with another freeway beyond I-80. 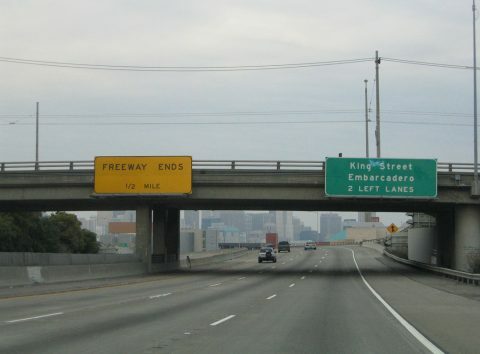 Since the proposed alignment of I-280 had yet to be constructed prior to the revolt, it was dropped from plans in its entirety. 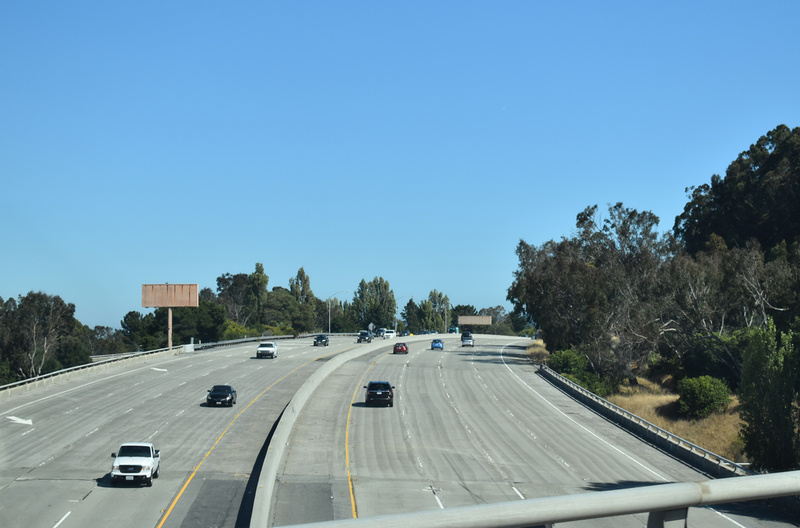 As a result, I-280 was rerouted onto the SR 82 corridor north to U.S. 101 and SR 87 from there to Interstate 80. 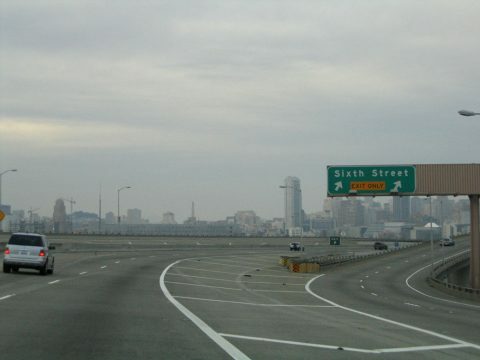 Interstate 280 was retracted two blocks west from 3rd Street and realigned onto King Street due in part from damage during the 1989 Loma Prieta Earthquake and the subsequent redevelopment in the vicinity of the San Francisco Giants ballpark. 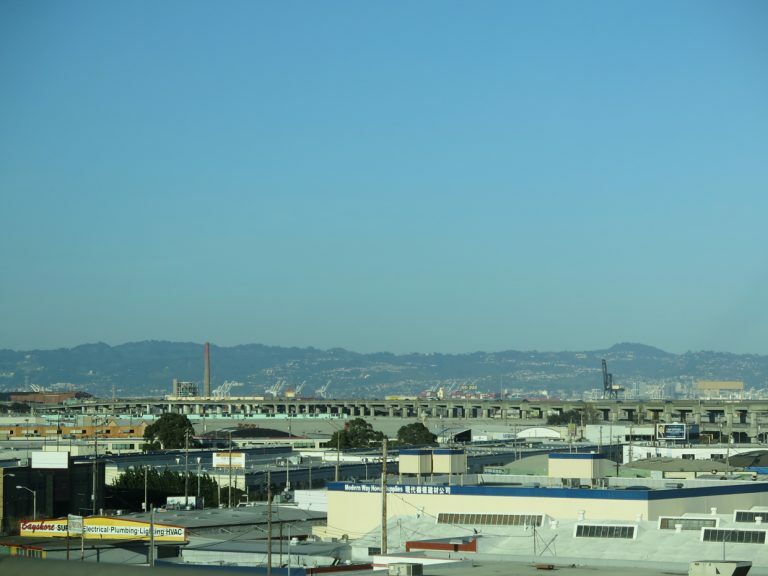 The elevated roadway previously ran directly along side the China Basin Water Channel from the Sixth Street ramps to a stub end at 3rd Street in South Beach. 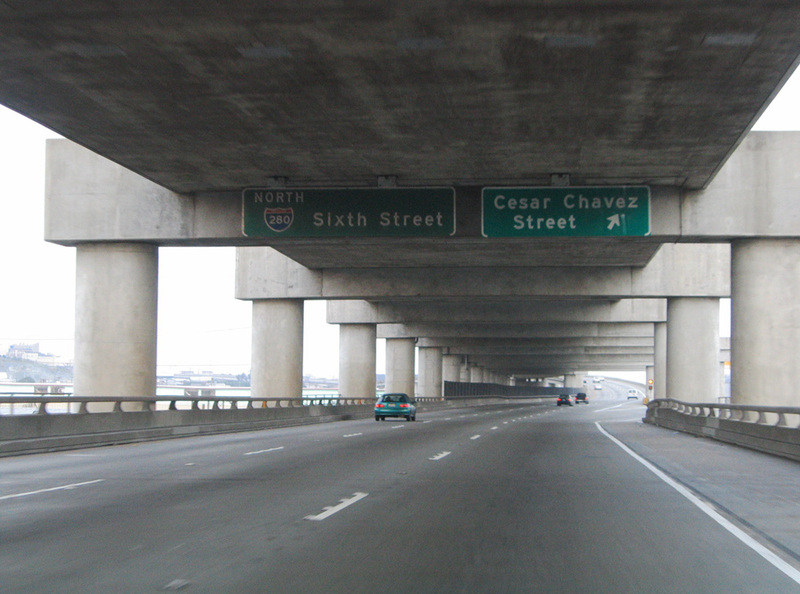 North from the interchange with U.S. 101, Interstate 280 follows a double-decked, elevated freeway to the off-ramp with Cesar Chavez Street (former Army Street). 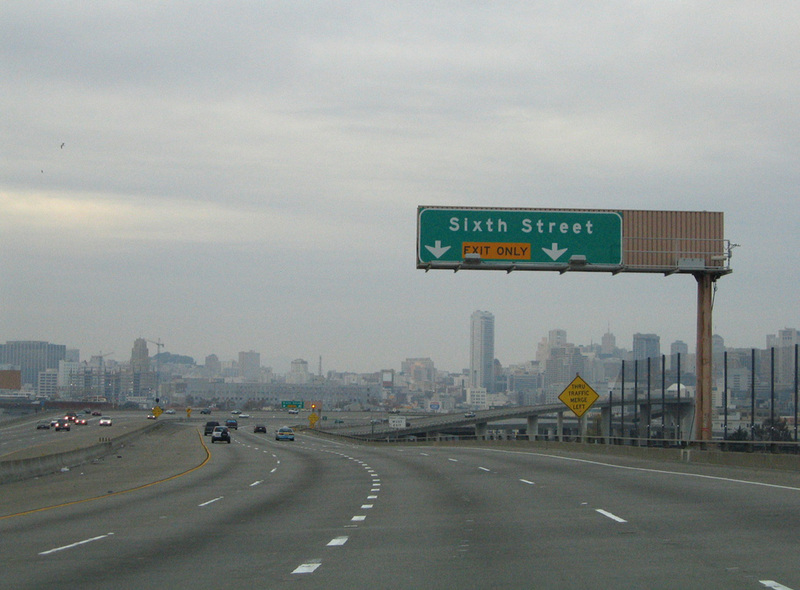 I-280 concludes in 2.4 miles at Sixth Street. Photo taken 11/26/04. I-280 north splits into the branches for Sixth and King Streets a half mile beyond the diamond interchange (Exit 56) with 18th Street at Potrero Hill. Photo taken 11/26/04. 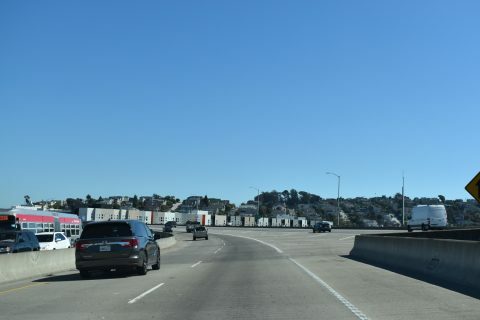 The skyline of Downtown San Francisco comes into view as Interstate 280 navigates through an S-curve between the Portero Hill and Mission Bay neighborhoods ahead of Exit 57 to Sixth Street. Photo taken 11/26/04. 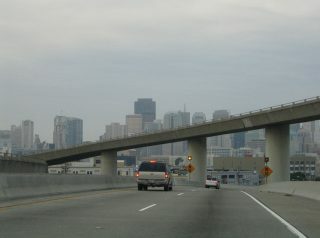 A two lane flyover departs from I-280 north for Sixth and Brannan Streets in the South of Market (SOMA) district of San Francisco. Sixth Street north to Bryant Street east connects with I-80 across the San Francisco-Oakland Bay Bridge. Photo taken 11/26/04. 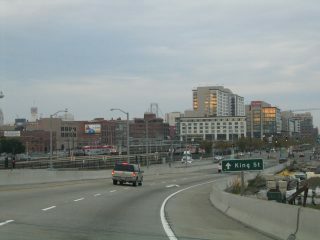 Continuing through the wye interchange (Exit 57) to Sixth Street, I-280 lowers onto King Street ahead of Oracle Park and the Embarcadero. Photo taken 11/26/04. King Street extends from I-280 and 5th Street two blocks to Oracle Park (home of the San Francisco Giants) and South Beach. North from there, King Street transitions onto The Embarcadero toward the many bayside attractions that San Francisco has to offer, including Rincon Point, the Ferry Building, Pier 39, and Fisherman&apos;s Wharf. Photo taken 11/26/04. 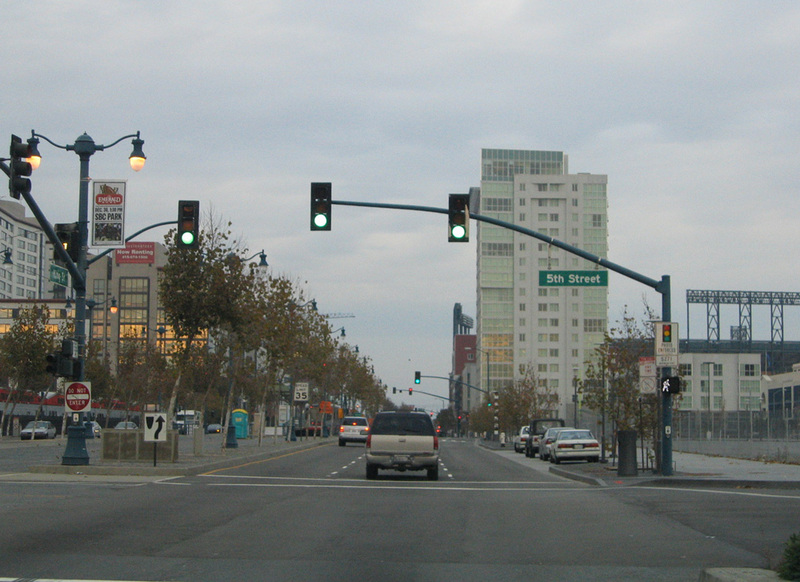 King Street extends two blocks southwest from Oracle Park, home of the MLB San Francisco Giants to become Interstate 280 at the signalized intersection with 5th Street. Photo taken 07/11/18. Southbound Interstate 280 begins as a viaduct, carrying the freeway above the neighborhoods of Mission Bay and Potrero Hill. 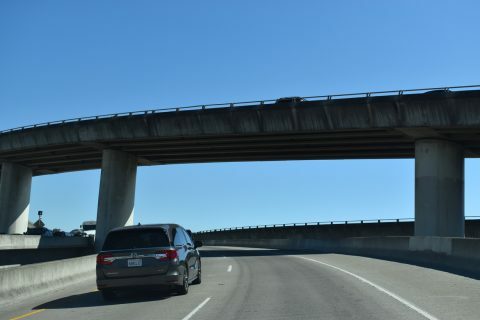 As a result of damage sustained after the Loma Prieta Earthquake of 1989, the elevated roadway between Fifth Street and U.S. 101 was reconstructed. Photo taken 07/11/18. 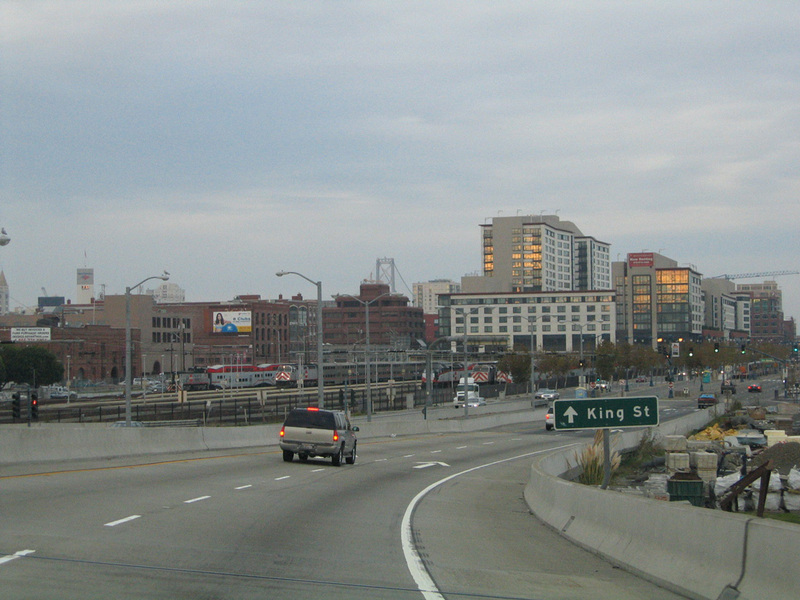 The I-280 leg from 6th and Brannan Streets converges with the entrance ramp from King Street at a wye interchange above the China Basin Water Channel. Exit 56 follows to Mariposa and 18th Streets in Portero Hill. Photo taken 07/11/18. Crossing over Coyote Creek, I-280 curves northeastward on the final approach to U.S. 101 and Interstate 680. Photo taken 07/16/09. 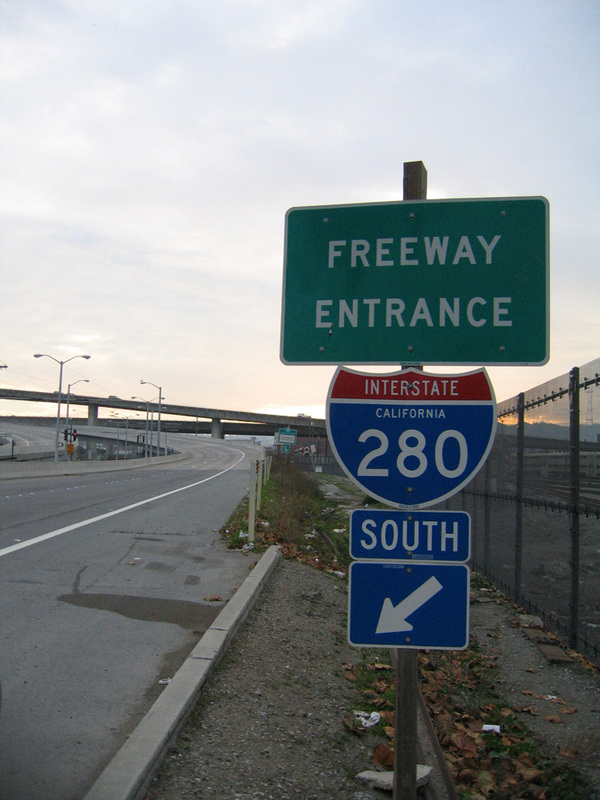 Guide signs reflect the transition of I-280 southbound to I-680 northbound starting at the McLaughlin Avenue off-ramp. Photo taken 07/16/09. 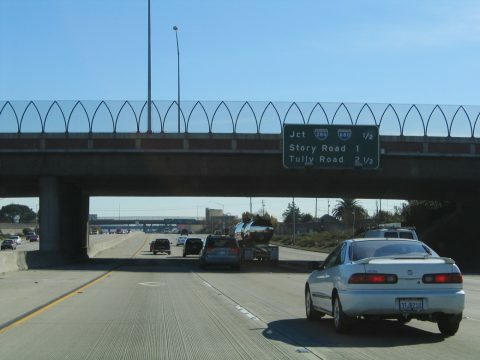 Entering the four level interchange with U.S. 101 north to Santa Clara and San Francisco and U.S. 101 south to Gilroy and Los Angeles. Photo taken 07/16/09. I-680 south turns west from Alum Rock, San Jose between North Valley and East San Jose toward U.S. 101 and the transition to Interstate 280 north. Photo taken 03/27/16. Interstate 680 turns southwest between the Mayfair and Arbuckle communities to King Road (Exit 1C). A double lane drop follows the King Road exit for the flyover ramps to U.S. 101 (Bayshore Freeway). Photo taken 11/28/10. 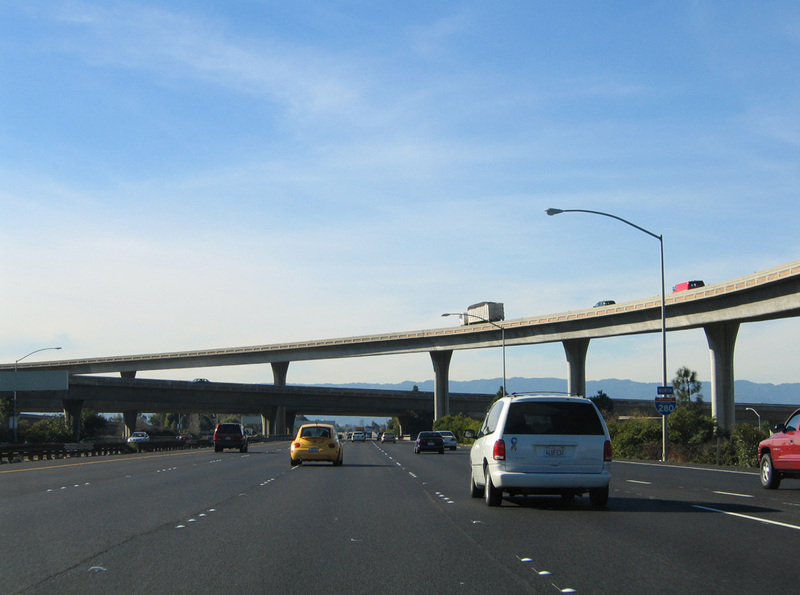 Interstate 680 south maintains four through lanes for the continuation onto I-280 north. 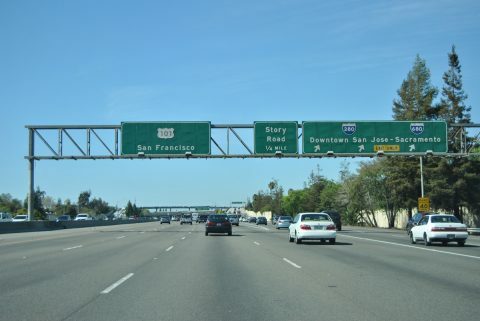 Three lanes depart otherwise for U.S. 101 north to Santa Clara, Sunnyvale and San Francisco and south to Santa Teresa, Salinas and Los Angeles. Photo taken 11/28/10. The first confirming marker for I-280 northbound stands within the cloverstack interchange at U.S. 101 east of Downtown San Jose. Photo taken 11/29/04. 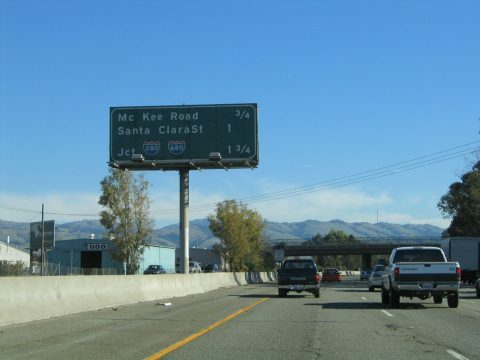 U.S. 101 advances one mile north to the cloverstack interchange (Exit 384) with Interstate 280 north to Downtown San Jose and Interstate 680 north to Fremont and Walnut Creek. Photo taken 03/25/16. Interchange sequence sign posted 0.75 miles ahead of Exit 384 for I-280 and I-680 north. The forthcoming flyover passes above the cloverleaf interchange with Story Road (Exit 385). Photo taken 03/25/16. U.S. 101 north expands to six lanes with an auxiliary lane gained from Tully Road. A two-lane off-ramp (Exit 384) follows for Interstates 280 and 680 north. Photo taken 12/23/04. Traffic departs U.S. 101 north for Exit 384 ahead of Story Road. 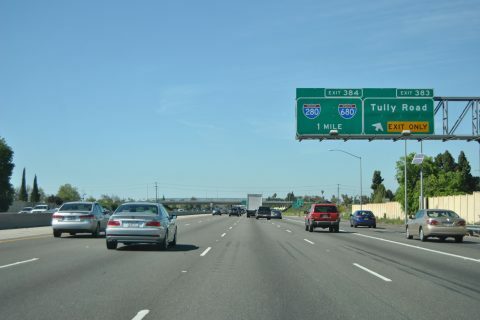 Interstate 280 north arcs southwest toward Downtown San Jose, then north to Daly City and San Francisco. Interstate 680 travels north to Fremont, then angles northeast via Sunol Grade to Pleasanton / Dublin and onward to the San Ramon Valley. Photo taken 03/25/16. U.S. 101 (Bayshore Freeway) meets Santa Clara Street / Alum Rock Road (SR 130) on the approach to I-280 north to Downtown San Jose and I-680 north to Fremont and Walnut Creek. 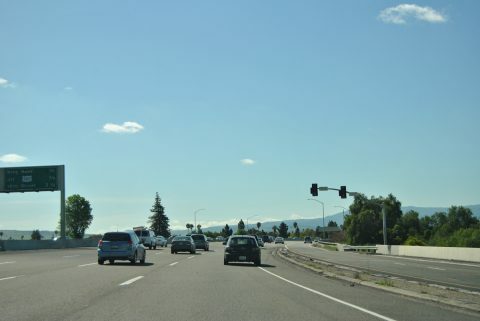 SR 130 is a winding road to Mount Hamilton that was previously planned as a freeway from San Jose to the Central Valley. Photo taken 11/29/04. One half mile ahead of Exit 385B for I-280 and I-680 on U.S. 101 southbound. 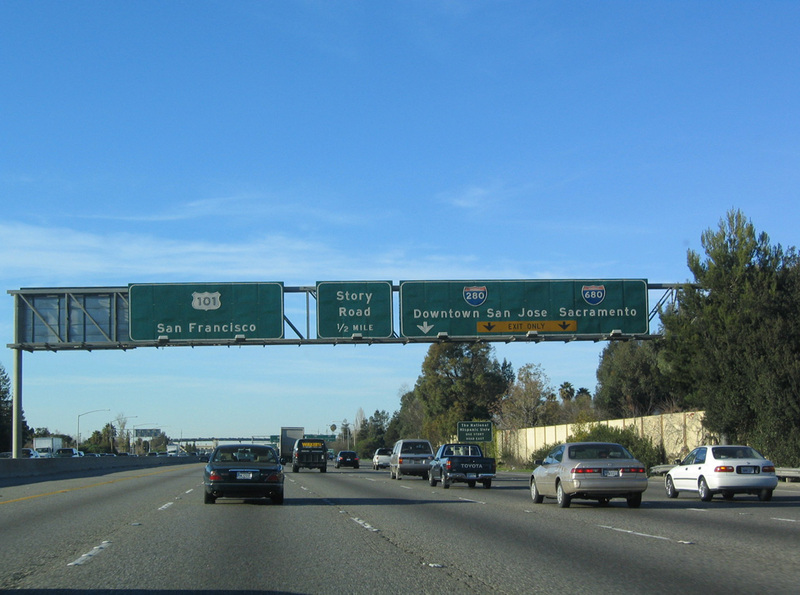 Interstate 680 is signed for Sacramento, but it passes through several major cities including Pleasanton, Walnut Creek and Concord along the way north to I-80 at Fairfield. Photo taken 11/29/04. Page updated March 12, 2019.